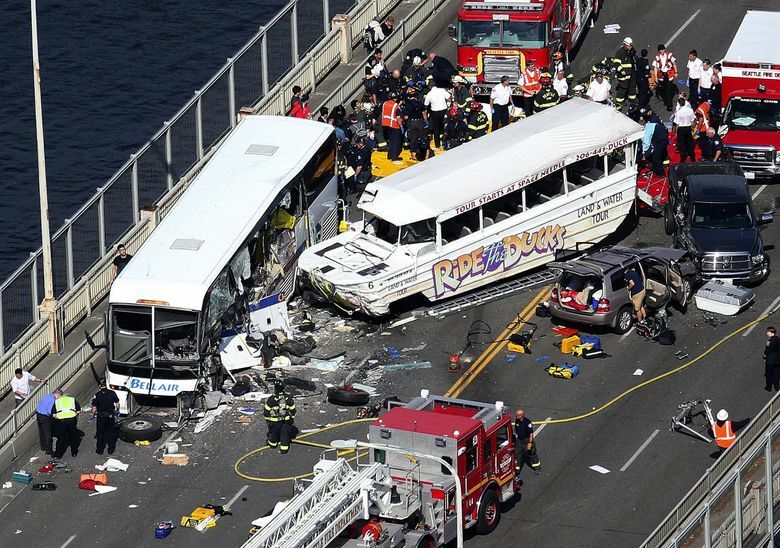 Five people were killed and dozens injured in the 2015 crash on Seattle’s Aurora Bridge. Now the Missouri manufacturer of the amphibious vehicle has agreed to pay civil fines for violating federal safety rules. The Missouri-based manufacturer of the amphibious Ride the Duck tour vehicle that crashed on Seattle’s Aurora Bridge last year, killing five people, has agreed to pay up to $1 million in civil fines for violating federal safety regulations, U.S. transportation officials announced Tuesday. Ride the Ducks International (RTDI), which built Duck No. 6 that crashed in Seattle, entered into the federal consent order after admitting it failed to notify federal transportation regulators and issue a recall — as required — of its so-called “Stretch Duck” vehicles after discovering they potentially had defective front axles. Instead, RTDI inspected and modified the affected vehicles it still owned and issued an October 2013 service bulletin notifying independently owned licensees and other customers that had bought other vehicles subject to the repairs. Federal investigators later found the local Ride the Ducks of Seattle firm never made the recommended repair to Duck No. 6, which lost control when its axle broke off, then plowed into a bus chartered by North Seattle College, as the vehicles motored across the Aurora Bridge in opposite directions on Sept. 24, 2015. The crash killed five international students riding in the bus and injured dozens of other people. The agreement announced Tuesday requires the Branson, Mo., company to pay $480,000 in fines over the next two years, and spend $20,000 on other safety and outreach measures to ensure compliance with federal transportation safety laws. The company will owe another $500,000 if federal investigators find further violations of the agreement or of safety laws. The agreement did not include a recommendation by the National Transportation Safety Board (NTSB) to require that all 57 Stretch Ducks manufactured by RTDI and that are now operational nationwide be suspended from roadways until an independent third-party certified that their axles are safe. A spokesman for Ride the Ducks International did not immediately have a comment about the agreement Tuesday. But in a statement posted on its website last month, the company said that the NTSB recommendation wasn’t necessary because the axle issue had been addressed. Following the deadly crash in Seattle, the Missouri company “immediately coordinated with all four Stretch Duck operators to have every axle inspected” by a third party which confirmed “no systemic issues,” the company’s statement said. “Additionally, the NTSB did not identify any history or record of problems for this axle which is rated by its manufacturer for significantly more weight than RTDI vehicles carry; this was an unprecedented failure,” the statement added. The Missouri firm — which refurbishes two varieties of the World War II-era amphibious Duck vehicles — claimed it has long followed U.S. Coast Guard and state and local regulations but didn’t know that it also was subject to U.S. Department of Transportation regulation under the National Traffic and Motor Vehicle Safety Act. That federal law — which generally applies to manufacturers of new motor vehicles — requires them to notify the NHTSA and take other measures when discovering potentially defective parts that jeopardize vehicle safety. Federal transportation authorities said they’ve established that the law also applies to motor vehicles manufactured using some vintage and new parts, such as the Stretch Duck involved in the crash. RTDI builds Stretch Ducks using hulls from vintage World War II Ducks, combined with new engines and transmissions, and refurbished axles. The local Ride the Ducks of Seattle firm already had agreed to suspend its 10 Stretch Ducks from operation under a settlement with the state. Mark Firmani, a spokesman for Ride the Ducks of Seattle, said Tuesday the firm has “no immediate plans” to return any Stretch Ducks to service. In its own investigation of the crash, the Washington State Utilities and Transportation Commission found hundreds of safety violations by the Seattle Ducks’ firm, imposed a $308,000 fine and ordered the company to address all of its violations before returning to operation. The Seattle company has since resumed operating 10 “Truck Ducks” — a different kind of amphibious vehicle from the one involved in the crash — on tours that no longer cross the Aurora Bridge. Both Ride the Ducks companies still face various lawsuits filed on behalf of more than two dozen crash victims or their surviving family members.